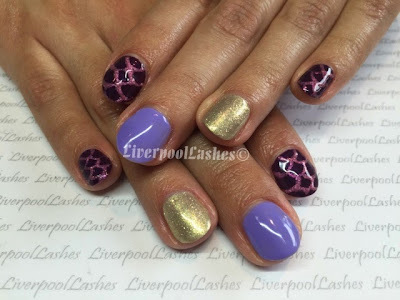 When fellow nail technician Jade came to visit and have her nails done, I knew it was going to be an exciting day. The only let down is that Jade is to the most indecisive person ever so she had no clue what she wanted, she just told me that yellows and greens were a no-no as she didn't think they suited her skintone. She didn't really want pink as that's the colour she had on last. 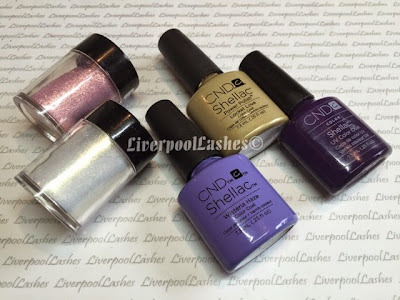 As Jade couldn't make a decision, I decided on CND Shellac in Rock Royalty, Wisteria Haze and Locket Love. I made a glitter paste with Lecente Stardust in Cluster (top coat and glitter mixed together) and painted a fish scale pattern over the purple. I then used Lecente Stardust in Milky Way to apply over Locket Love which took some of the yellow tones out of Locket Love and made it an even more beautiful shade. Since Jade generally wears one shade on all of her nails, I should imagine this will be quite a change for her!